Home Sports Seasons Lady Rams Fall Short Against Bloomsbury Huskies 12-9. In the first minute of the half, freshman Abby Bergman, made the first goal for the huskies, jump starting the game. Making that her 6th goal for the season. Shortly after, her teammate, senior Megan Smith, secured another goal for the huskies making that her 7th goal of the season. At the 26:04 mark the Huskies were already up 3-0. 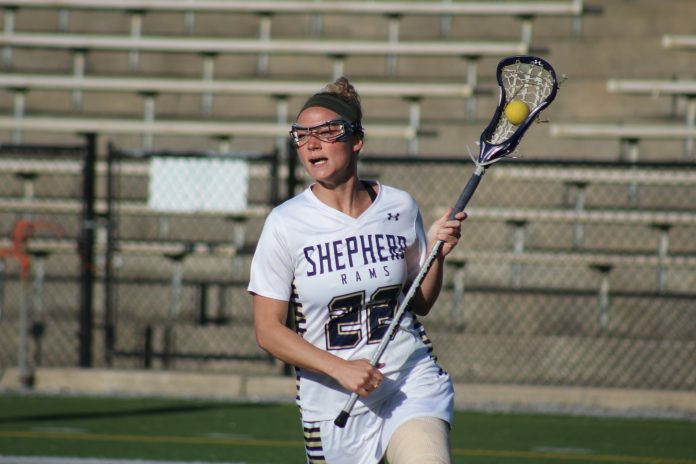 The lady rams picked up their offense in the middle of the first half when senior Anna Munford, collected five ground balls to help her team develop some offense. Sophomore Lillian Funke and senior Sarah Wendt contributed, by Funke scoring two goals with an assist by freshman Regan Brown, while Wendt added a goal and showed her experience on the field, with some great passes, and checks; bringing the rams close behind the huskies at 3-2 at the 25:08 mark in the first half. Sophomore, Jordan Sauro, had two goals in a row to keep Shepherd in the game. Entering the second half, Bloomsburg with 6 and Shepherd with 5 with the goal by Brown and draw control by Funke. Senior Casey Hickman had back to back saves at the 29:53 and 29:35 mark to keep her team stable. The All Conference Goalie had another strong performance with 15 saves.Munford continued to contribute for her team forcing multiple turnovers. However, the lady Rams were not able to keep up their defense as the second half came to an end. With back to back goals for Bloomsburg by senior Tracy Rusen at the 2:19 mark and junior Hannah Jaskuta delivering a dagger in the final minute of the game. Wendt had a turnover at the 1:22 mark, followed by another turnover by Munford. Time would expire giving the Rams their fourth lost on the season. See the lady rams back in action on Monday, April 9th, 2018 vs Millersville, 4 p.m. at home.